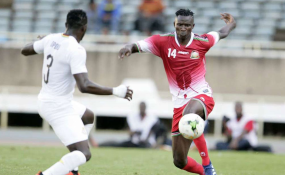 Harambee Stars striker Micheal Olunga (right) under pressure from Ghana's Nicholas Opoku during an Africa Cup of Nations qualifier match at Moi International Sports Centre, Kasarani (file photo). Kenya is likely to line up against a star-studded Ghanaian team when the two nations meet in the final Group D fixture of the 2019 Africa Cup of Nations qualification. The match is set for Accra on March 22 and Black Stars' coach Kwesi Appiah has summoned among other players Belgium-based defender Joseph Aidoo. Team captain Asamoah Gyan and Daniel Amartey have however been ruled out with injuries with Andrew Ayew set to don the captain's armband. Five players are also in line to make their debuts for the Black Stars, including Asante Kotoko's duo of Amos Frimpong and goalkeeper Felix Anan. Both players starred for the club against Kariobangi Sharks during a Caf Confederation Cup clash in December. The Black Stars are seeking revenge over Sebastian Migne's Harambee Stars following the 1-0 loss they suffered in the first leg in Nairobi last September. Although both teams have already booked their tickets to the biennial tournament, the match winner will finish top of the group, which also has Ethiopia. Migne has already named his squad which includes captain Victor Wanyama, goalkeeper Patrick Matasi and debutant Chris Mbamba.